i am trying to over-express a recombinant protein in E. coli heterologous system. My protein is on pET 28 a(+) plasmid (T7 polymerase, kanamycin resistant). I inserted this vector in E. coli BL21 (DE3). As you can see in the picture, lane 6 correspond to an uninduced control. Can someone give any advice how express my protein in the right way? 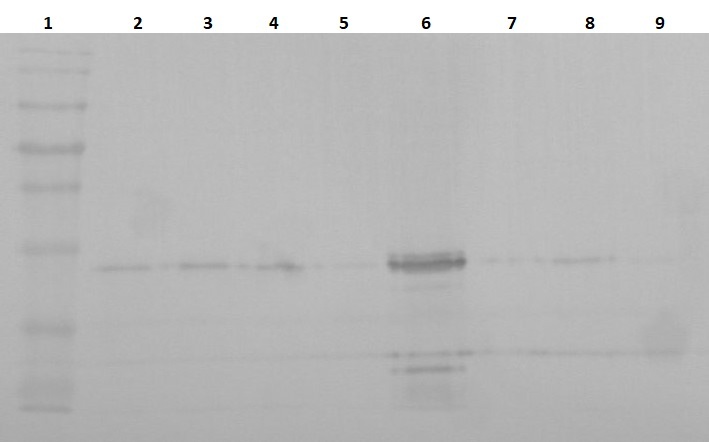 How are you preparing the protein for western blot? Pellet was collected and resuspended in lysis buffer (triton x-100, NaCl 3g/L, tris 50mM, glycerol 10%), sonicated and centrifugated at max speed for 20 minutes. Supernantant was collected and quantified by microBSA method. the protein amount loaded was 15 ug per lane (with loading buffer). I did it before with other proteins and results were has expected. I agree with Thelymitra pulchella. Your protein may be aggregating into inclusion body form. For avoiding this situation, you may need some advises, such as 1) fusion of the target protein with a more soluble partner, typically a bacterial protein; 2) co-expression of folding catalysts and chaperones; 3) expression under culture conditions which reduce the translation rates or affect the intracellular environment; and 4) modification of the protein sequence.